On 20th and 21st March 2014, a group of 50 experts from a broad range of disciplines gathered in Cornwall, UK, to discuss the complex interactions between the marine environment and human health. Delegates of the workshop unanimously called for a coordinated, transnational and interdisciplinary oceans and human health research programme in Europe. They recommended that research should be solutions-oriented, supporting health and wellbeing promotion and disease treatment, and informing maritime, environment, public health and innovation policy. 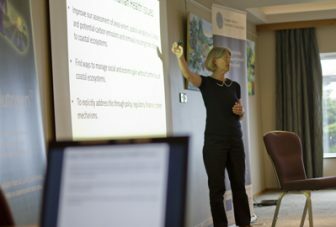 The workshop was convened by the European Centre for Environment and Human Health and the European Marine Board with organizing support from Ifremer, the Scottish Association for Marine Science and Plymouth Marine Laboratory. Resources from the workshop are available to the right of this page, including a message from the delegates and an oceans and health position paper compiled by the European Marine Board. The vision of the Wellcome Centre is to engage with diverse partners to create and sustain cultures that enable health and well-being across the life course. We want our research to be influenced, created, and conducted by and with people whose lives are affected by the research and its outcomes. Experience, hands on, how virtual reality and other emerging technologies are being applied in various sectors from health and social care to gaming.